Fresh Cherries with Dark Chocolate Chunks in a Dairy Free Frozen Yogurt Base... Yum! Cherry Garcia and Cherries Jubilee are getting a run for their money! I really try hard to eat what's in season. Especially now that I live in Boston which is not really known for its abundance in variety of fresh local fruits and vegetables. You kind of have to eat in season in Massachusetts unless you want to blow your entire grocery budget for the month on one shopping trip. And that ain't my bag. I would rather blow the entire grocery budget on one nice dinner out. Just kidding... kinda. Be sure to let the Cherry and Chocolate Chunk Frozen Yogurt sit out on the counter for a bit so you can scoop it easily. Since there are no preservatives it freezes firm! Pitting cherries is a pain in the buttocks. So instead of wasting your money on the one trick wonder of a cherry pitter, get a cheap, round icing tip. A finer point works best, but really any will do. Just stick the top where the stem meets the fruit on the point and push down. Voila! Pitted cherry still in tact. Freeze cherries for baking all year-round. Spread pitted cherries onto a baking sheet and freeze until solid (3-4 hours), then transfer to a releasable freezer bag. Frozen cherries are a great option in many recipes, especially pies and for dessert sauces. 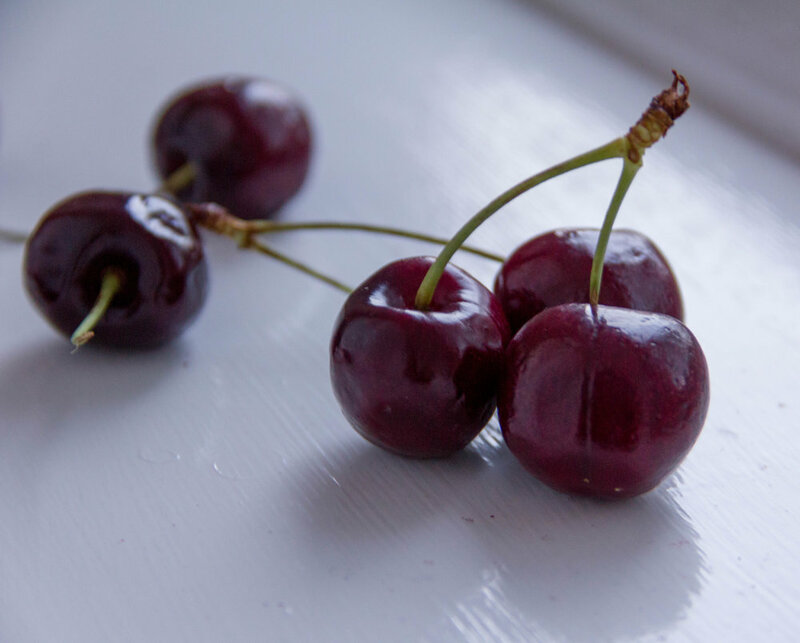 Cherries are a great source of Vitamin C so you should eat more of them. Plus, sweet cherries have melatonin in them so they are a great healthy snack to have in the evening when you are craving something sweet. Loads of fresh cherries in this recipe!! I will likely have more cherry recipes popping up in the posts to come since this giant bag is taking up coveted kitchen counter space, but for today I have created a Cherry Garcia-ish/ Baskin Robbins Cherry Jubilee-like frozen yogurt. My version goes dairy free by utilizing coconut cream greek yogurt and almond creamer. Add in some dark chocolate chunks and you have yourself a dairy free, antioxidant rich, super food fro-yo. Cherry and Chocolate Chunk Frozen Yogurt Recipe... Dairy Free!